Orgonite has become very popular as an effective spiritual healing tool, and as protection against electromagnetic pollution (emf). These subtle energy tools interact and transform orgone or life energy. If you are interested in obtaining my orgonite products, please go to my website Soul-Guidance. The word orgonite comes from “orgone”, the name given by Wilhelm Reich (1897–1957) to vital energy found everywhere in nature. It is life energy, also called Ch’i, Prana, Aether. This vital energy exists, in a natural way, under many different forms. It can be neutral (OR=orgone), positive (POR=positive orgone energy) or negative (DOR = deadly orgone energy). When positive, it enables living organisms to exist in a healthy state. Reich did a lot of research on the properties and behaviors of this energy. He built an orgone accumulator out of alternate layers of metal and organic material. He also observed that OR was able to neutralize nuclear radiation. It is important to understand what DOR is. DOR is (P)OR, but “armored” as Reich called it. “Armoring” means that the orgone, or life energy, does not flow freely anymore, but has been encapsulated into a rigid form. When a knight puts on his armor, he cannot move freely anymore; he is restricted in his movements. The same with orgone energy: when orgone energy gets “armored” it does not flow freely anymore. Look at nature. When water flows freely, is full of vitality and life in it flourishes. When water becomes stagnant, it becomes like a stinking pool, and life in it dies. DOR is negative, that is, it suffocates life forms. It creates disease, and ultimately it will cause death. DOR energy is primarily human made, by technology, like machines and microwave transmitters or smart meters, chemical pollution, physical destruction of the landscape, but also by human emotions. A place where a violent death occurred, for example, will retain the DOR imprint on that location for a long time. A house where the inhabitants have a lot of negative emotional outbursts will also be laden with DOR. The human body itself can also be armored. Life long emotional problems can limit or block one’s creative expression, causing contraction of his energy system, leading to disease. Orgonite is a mixture of catalyzed fiberglass resin with metal shavings, particles or powders, poured into molds. Sometimes a couple of crystals or minerals are added to the mixture to make the energy more coherent or to enhance the working the the orgonite.The metal parts attract, gather, and accumulate the life energy (subtle energy, aetheric energy, vital force etc.) that is all around us, similar to Reich’s orgone accumulators. 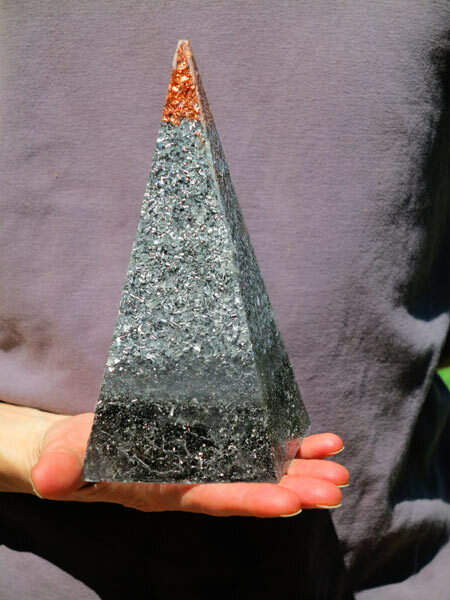 Once absorbed into the device, all the orgone energy is transformed and send out with a positive, life enhancing quality. Orgonite basically is a substance which functions as a self-driven, continuously-operating, highly efficient energy transmutation device, drawing in both positive and negative life energy (Or and DOR) and transmuting it into positive orgone energy (Or). The resin in orgonite shrinks during the curing process, permanently squeezing any quartz crystals inside creating the well-known piezoelectric effect inside the crystal lattice. The end-points of the crystals become electrically polarized, and apparently this causes the orgonite to function more effectively. Although crystals improve the function of orgonite, they are not necessary for the orgonite to work. Anyone can build these devices with easy to find materials. Orgonite is simply a mix (approx. 50/50 ratio) of metal and resin (polyester, urethane or epoxy). It can be poured into all kinds of shapes: pyramids, cones, disks, cylinders and pendants, to name a few. Some people use it to combat pollution and cell tower radiation. 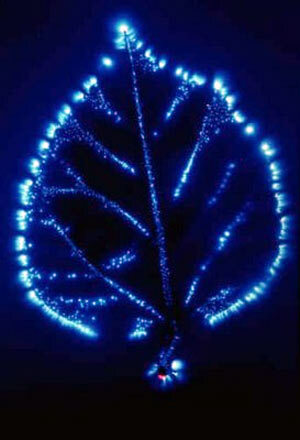 Others use it for clearing or purifying energies in their houses, or to enhance the growth of plants in their garden. It also works really well in various kinds of spiritual healing work. Energy sensitive people have given me various comments on how orgonite affected them. They have shown me that it really does work. 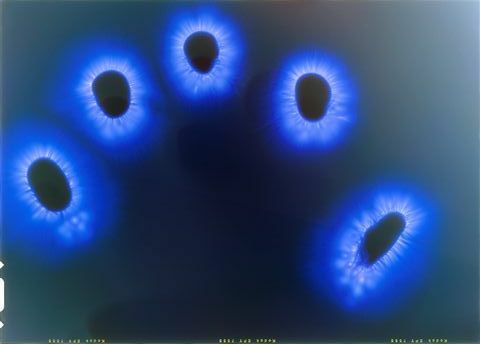 Kirlian picture of a healthy person’s finger tips. 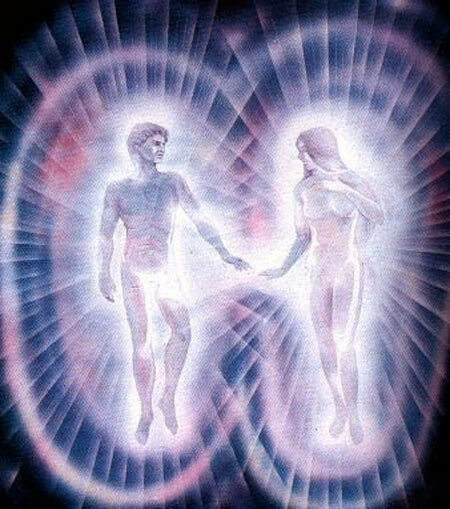 Kirlian picture of the same person, but now holding an orgonite piece in his other hand. Stronger, more vibrant colors.Don Croft who made orgonite mainstream, tells us that his daughter, who could see subtle, or orgone, energies, saw that orgonite pieces gave off a bright blue radiance. A biological body has a fine energy structure, usually called the aetheric body, with energy centers, the chakras and energy channels, the nadis. All this transforms and guides life energy through the body. It keeps the body not only alive, but also healthy. When a being is subjected by trauma, physical, psychological, emotional, or spiritual, it reacts with fear, and a contraction of the energy system takes place, often locally, at one location of the body. Usually the body maintains this contraction because it doesn’t understand that the trauma has passed. This contraction limits the energy flow in the body, creating an imbalance and weakening. Slowly disease sets in. A human being can unconsciously create an energy structure in his energy field that becomes rigid and it obstructs the free flowing life energy. It is like the armor of a knight; it protects the individual against perceived treats. Fears are mostly unconscious drives that originated in the past, but that continue to work in the present. The armor itself is an energy structure, rigid in nature. It can be small and local in a small spot of the body, or it can envelop the entire body, depending on its nature. The problem is always the same. The armor limits energy flow. It is like a dam that restricts the water flow of a river. It weakens the body or body part, slowly creating disease. Then microbes will go where the cells are in a weakened state. Eventually the disease will create the death of the body. That is why Reich called this obstructed, restricted or limited energy flow structure DOR, Deadly Orgone Energy. Orgonite transforms this DOR, or deadly orgone Energy) and makes the energy flow again. Reich discovered that all metal attracts orgone energy, both positive and negative, but also immediately releases it. With orgonite we have thousands of little metal particles all attracting OR and DOR at the same time, and then immediately releasing it. As these metal particles are all next to each other they continuously exchange the energy they have absorbed. This happens so quickly and so many times that the rigid, armored DOR gets shaken loose and becomes free flowing energy, OR, again. This way orgonite acts as a transformer for DOR into OR. This is how powerful orgonite is. Having an orgonite product in your energy field, or aura, is like having an energy transformer. It will clean up stuck or armored energy structures in your energy field. Of course, its effectiveness also depends how old and strong the armored energy structures are. Orgonite can be effective immediately or it might take a long time, but it is always working. When you are in an environment that emits a lot of negative energies, like in a stressful work environment, or with people who have negative emotions, orgonite can make a big difference! I have been told that orgonite will also remove negative entities from a house. Negative entities are often characterized by their tendencies of imposing their will upon the living, for example out of anger, or by wanting to control the occupants of the house, and often they feed of the life force of the living. Independent scientific research has shown and proven that electromagnetic signals in the radio frequency band affect the human body in a negative way. This depends, of course, on the frequency itself, its duration and its intensity. Microwaves also are especially harmful. It does not matter if they are ionizing or not, if they are heating tissue or not. The military did extensive studies, in the 1950’s, that proved that microwaves were very harmful to the human body. However, commercial companies don’t care about your health, and microwaves made their entry into our every day lives. Microwave ovens were a convenience, but also a danger as they do leak microwaves of high intensity. Then came the cellphones and cell towers, and smart meters. 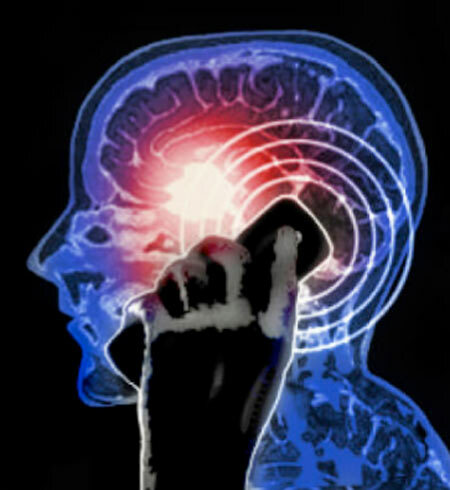 The medical industry has proven, again and again, that cell phones damage the brain tissues, the blood-brain barrier, and lead eventually to brain tumors. Cell towers themselves are huge transmitters of microwaves. Smart meters blanket the entire neighborhood in pulsed microwaves. I am getting more and more customers who are buying orgonite for counteracting the effects of the smart meters. They tell me it works. Of course, orgonite does not block the microwaves, or any other EMF’s themselves. In my opinion orgonite has two effects. First, when placed nearby a device that emits EMF’s, such as a computer or TV, and near a smart meter, it transforms the etheric side of the electromagnetic field that this device emits. All electronic devices emit a physical electromagnetic field (and waves), but also an etheric, or energetic counterpart that is harmful to the etheric or energetic biofield of the human body. This is because electrical devices are artificial. When an orgonite piece in placed in this field, it transforms this etheric counterpart in a more natural quality that is friendly to the human biofield. Second: When orgonite is worn on the body, and thus it is inside one’s own biofield, it transforms this biofield by cleaning up stuck energy and making it more positive, and at the same time it strengthens the biofield a lot, making it much more resilient to incoming harmful energies, including the EMF’s and microwaves. I strongly recommend that you read my Customers Experiences page. There is no better proof than what my customers have reported to me how orgonite has changed their lives!Here I will give you my initial experiences when I started making orgonite several years ago. My first orgonite device had a two gallon base of orgonite with standing metal pipes anchored in it. I prefer to call it a Harmonizer because I feel that this device has a harmonizing influence upon its environment. The commonly used term is cloud buster, cloudbuster, or chembuster. When I put the Harmonizer in the garden, I noticed that the environment gradually changed for the better. This is a subjective observation, but I noticed that the air felt clearer, more laden with vital energy. Some of the vegetables in the garden which had been growing poorly in past years, improved tremendously. One year, the bean plants totally enveloped the harmonizer. Lots of bean production too. One day, a friend, who has psychic gifts, came by. She said that the Harmonizer was giving of tremendous positive energy. Also a neighbor who has intuitive awareness and who didn’t know I had made the harmonizer said to us that she had felt a strong positive change in the energy of the neighborhood. She was wondering where it came from. I started giving orgonite products to friends, acquaintances, and email contacts who gave me some interesting feedback. Two of my contacts have reported that since they put my orgonite cones in their house, the number of spirits that used to bother them was drastically reduced. Both of them were psychics who who can see and feel spirits/ghosts. 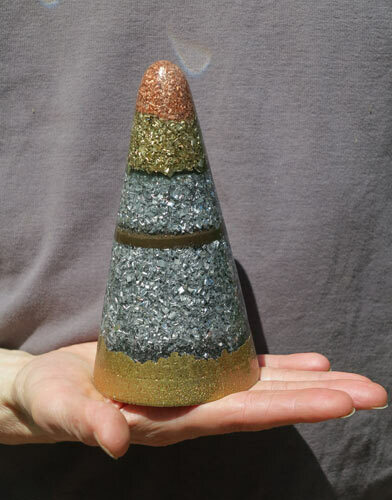 When I visited another friend, who is a wholesaler of crystals, I gave her an orgonite cone. She had no idea what orgonite was. She was holding it in one hand, then she put it on the table. She was astonished that she was still feeling an after-image of the cone on her hand, like the energy of the cone was still present on her hand. This had never happened to her before. Another woman, an artist and energy sensitive, held one of my orgonite cones in her hands and meditated on it. She said unlike other objects, the orgonite cone calmed and centered her. A friend who brought a cone into her house noticed that her neighbor’s nasty behavior toward her immediately stopped. Some people are very sensitive to other people’s energy and can get badly affected by it. A customer, who could even feel the neighbor’s energies entering her apartment, reported that since she put one of my orgonite disks in her room, these invasive energies stopped entering, and in whatever room she brought the disk, she was unaffected by the neighbor’s energies. I went to my chiropractor-healer, also a sensitive person. I had brought an orgonite cone with me as a gift for him. He told me that the moment I came in the room with the cone in my hand, his mood, which had been very depressed and agitated because of a divorce he was going through, immediately changed for the better. At that moment he didn’t yet know that I was holding an orgonite cone, nor why his mood so suddenly changed. Another day, I met another friend, a card reader and psychic, in town. He had set up to do readings. I gave him an orgonite disk without explanation. He usually is skeptical about “new age devices”. He was feeling it in his hands, and noticed that it had a “wonderful energy”. But furthermore, there was an immediate change in his left eye. He was having a lot of problems with this eye, losing part of his vision. He said that by holding the orgonite product, his vision immediately got better, emphasizing “a lot”. He was very surprised. Another friend came by one day, she had problems with ongoing breast cancer. She was scheduled for another biopsy. She didn’t know anything about orgonite. My wife took one of our orgonite cones to show her. The moment the cone entered her energy field or aura, she said “Oh, what is happening, I feel all these little pricks in my breasts.” She had not even time to notice the cone my wife was holding out towards her as they were engaged in a conversation. Of course I am guessing here, but it is my opinion that when the orgonite entered her energy field, it immediately transformed the DOR, or the negative stuck energy spots in her breasts that were associated with the cancer nodules. We sent some orgonite products to a lady in Texas, who is strongly psychic. She reported that when she carried the orgonite egg, it calmed her down, and she even didn’t scream at the kids. She was able to handle the kids in a calm way, a big change for her. Her two kids, who also show signs of being psychic, had nightmares every night, and were very restless when they slept. but now, ever since they put an orgonite disk under their pillow, the nightmares have disappeared and they sleep much more peacefully. The lady also said that paranormal activity in her house had quieted down significantly. A neighbor told me that the orgonite pendant I gave her is helping her against the radiation from the recently installed smart meter. Smart meters give of continuous pulses of microwaves. Microwaves, of any origin, are irritating to the biofield (which is the orgone or life field, or aura) of the human body. Orgonite strengthens the biofield, by which one becomes more resistant to the onslaught of ever increasing microwaves in our environment. Orgonite has been around for a while, and a lot of people have found it beneficial in multiple ways. Its primary function is to transform the subtle energies around us, and in our own biofield. 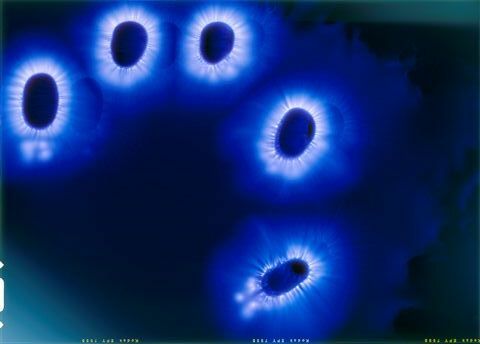 Its energy of effects are not measurable with regular scientific instruments, and present day science rejects the existence of subtle energies, which are of manifold nature, and to which people have given different names, such as the aether, etheric, life force, biofield, aura, orgone etc. The discipline that is very familiar with these subtle energies is dowsing. A friend of mine had dowsed one of my orgonite pieces and to his surprise he found that it gave off a lot of positive energy. On the web I found a document by Roger Taylor PhD., Studies on “Life-Energy” by means of a Quantitative Dowsing Method Comparison of orgonite with the orgone accumulator; spectrophotometric confirmation of its effect on water; nature of orgone.” (http://www.lifeenergyscience.it/english/2012-eng-2-2.pdf ) In his experiments he found that the energy of orgonite fluctuates with time, and depends on the weather and time of day. These energy fluctuations are well know among dowsers, especially with earth energies, such as ley lines. The Earth (the soil, rocks and atmosphere) is subject to a constant stream of aetheric energy from space. This cosmic energy varies with the position of the Sun, moon and planets in relation to the earth, the solar wind, and the stream of cosmic particles entering our solar system. We, human beings are also subject to this fluctuating energy. Roger Taylor makes the suggestion that orgonite has a large scale quantum coherence, such as in superconductors. This means that electrons in the material do not behave individually, but as one large unity. He comes to this conclusion because orgonite has dowsable rings around itself. The rings of energy are well known by dowsers and are found with other objects or even trees. An example are the rings around megaliths. There are always a series of rings around such a stone. These rings are actually standing waves, and do not diminish with the distance as for example with electromagnetic waves. When looking around on the internet, I also came across a couple of statements from people who have used orgonite successfully to to transform a noxious earth energy line into a positive one. One time it was with placing an orgonite “cloudbuster” on the line; the other case was a placement of six “towerbusters” (a towerbuster is a 3 ounce piece of orgonite) in a circle, also placed on the noxious line. I had a similar experience, although by accident. In front of my work place ran a Wide Meandering Etheric Line, as dowsed by Robert Dahse . He classifies it as a negative energy line, which can vary from mild to very negative). Several years ago I had made another orgonite cloudbuster and placed it (unknowingly because I had forgotten about this energy line) on this Wide Meandering Etheric Line. Later, when I took the map of the property (with all the dowsed energy lines) out again, I discovered I had placed the cloud buster exactly on this line. I contacted Robert Dahse again, and he dowsed that this Wide Meandering Etheric Line was not there anymore. Normally the Wide Meandering Etheric Line can’t move around by itself. Tino Phuthego from Gaborone, Botswana (from Orgonise Africa) also found, by dowsing, that orgonite pieces can transform a noxious earth line into a positive one. Even a small 3 oz piece of orgonite, the so-called Tower Buster (TB), does it. Only the Curry lines did not respond to this treatment. But he found a solution to it: “Sometimes 3 TBS in a triangle did it….sometimes 6, but what worked every single time was an earthpipe….even a single one! The dowsers and geomancers that didn’t know orgonite taught me to jump lines using copper pipes, and this gave me the idea to try EPs. I have so far found this to be the most powerful technique. “ An earthpipe is a short metal pipe with orgonite in it at one side, usually also with a crystal. What is also interesting, is that after he has transmuted noxious lines with orgonite, people who were living on these lines started to feel dizzy and start having detox symptoms. So it seems that people who were living in these geopathic stress zones, start getting healthy. I wish more dowsers would investigate the energy field and the transforming action orgonite has on other energy fields, especially the human biofield. If you are a dowser let me know if you have some experience with orgonite. All i know is… Wonderful, very powerful. I got Orgone Product and took it in my house and after 2-3 months result i have saw is all my family set up now!